1. My niece was born on Tuesday :) About a week earlier than expected. This meant that Tim and I were able to meet her in person and spend her first Thanksgiving with her. I'm not posting any paparazzi photos of her at this time, but take my word for it, she's adorable. Our first stop was Stonemountain and Daughter. Okay. I want to move to Berkeley and get a job working in this store. The fabric selection is amazing! I wasn't able to decide on any of the silk prints for my dress, so I settled on a solid silk charmeuse in a jewel tone purple. Although I had promised myself I'd stick to fabric/notions for the new years gown, I couldn't resist picking up a little something else. 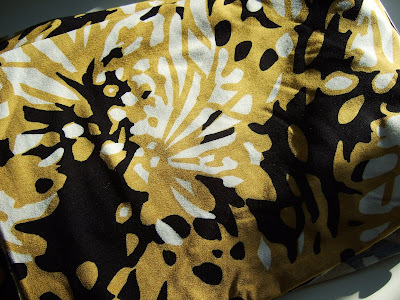 They have a great selection of knits - I was drawn to this black/white/mustard print. Next stop, Lacis. 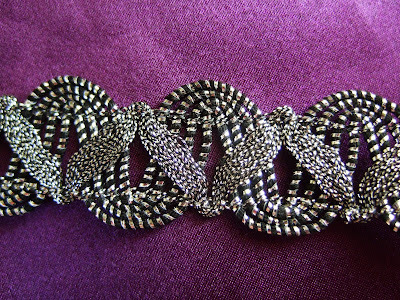 What an incredible selection of trims, ribbons, beads, lace, embroidery, millinery supplies, etc, much of it vintage. 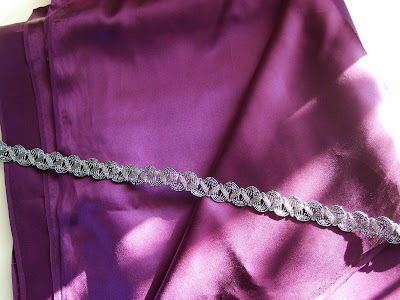 My primary goal here was to find trim for the shoulder straps of my new years eve gown. I selected this silver rick rack style trim, and I also got enough to use as a belt. My SIL told me there is a special room of laces, trims, etc in which you must be escorted and wear gloves to protect anything that you touch. She got lace for her wedding veil here. 3. Remember the two knits in my recent post "One Sunday, Two Garments"? Well, I like the two garments so much, I decided to morph them. I used the Burda 8771 dress pattern and replaced the collar with the cowl neck from BWOF 10-2005-114. The fabric is a camel color wool jersey that I got a couple months ago at the Pacific Fabric Outlet. I made this right before we left for the trip, and here I am modeling it at a walkway in the Oakland Airport on our way home on Friday. My sewing machine is going to be ready to pick up from its regular checkup/cleaning on Monday. Since the shop closes before Tim gets home (and we have just one car which he drives to work), I reserved a car with Flexcar so I can pick up my machine in the evening. There are two vehicles parked a few blocks from my house, and they just switched out the minivan for a Mini Cooper! Look out, Seattle. I LOVE your dress!!!!! Glad you had a good weekend! Sounds like a fabulous trip--love that purple silk. That is so cool that your baby niece came early so you could meet her. You look so chic in your dress. Sounds like a wonderful visit with the family. I think all of that shopping made the baby think she was missing out. Congratulations on your little niece. Your BWOF dress is adorable and you look so cute in it. Your NYE dress is going to look awesome on that fabric/trim combination. That jersey dress looks great on you. I must get my hands on that Burda pattern. Congratulations on the new addition to your family. This is my first time writing a comment to your blog, but heard your interview with Adrienne a couple of weeks ago and enjoyed very much. I love the fabric and the purple is great, and would be wonderful with the pattern you chose. Congrats on the bundle of joy!! I have 6 nieces, what a joy. Can I tell you how exicted I am about your purple fabric... and the trim is fire!! Can't wait to see the results. What a cute dress!! I love that Butterick. Both their evening gown retro offering this season are awesome. I just need them to go on sale again. Congrats on your niece. Beautiful trim and fabric, & I'd LOVE to go to Lacis. I've only ever ordered from them, though. Isn't Stonemountain AMAZING?! I'll be over there in two weeks. And thanks for the link to Lacis. I never knew it existed! Your dress is fabulous. Great, great look. Your dress looks awesome and the fabrics&trim are divine! Congratulations on the birth of your niece! ooh, congrats on your niece! I'm glad you had a good time, can you believe I've never been to Stonemountain? I think a trip is in order this weekend. :-) Love the purple charmeuse, what a great color for you. Isn't Stonemountain & Daughter just amazing! I still have pieces from my trip there 2 years ago. And like you said Laci's is just amazing...the amount of vintage trim is just astounding. Glad you had such a wonderful holiday and love the morphed dress! Nice morph, I like the colour of your jersey fabric. What a busy and full of emotions holiday (congrats on your niece) you had. Beautiful dress pattern - and that trim is to die for. Your fabric choices are wonderful, and I love the finished dress! Can't wait to see more! What a great dress! Congrats on the baby. Great finds! And, sewing for a niece will be so much fun - congratulations! I've added Lacis to my list of places - I'm nearby but didn't know about it. Thanks!